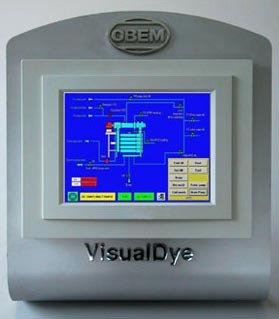 VisualDye Controller is the dyeing machine programmer designed by OBEM, developed on Windows system, and based on industrial PC with 10,4 Color Touch Screen display. VisualDye Controller is usually installed on the control panel of the machine and it starts up automatically when the electric panel is switched on. By using VisualDye Controller it is possible to control all the functions of the apparatus, in manual or automatic way, and in addition it is possible to create, start and modify, up to 400 dyeing treatment cycles, each one with 200 different steps. 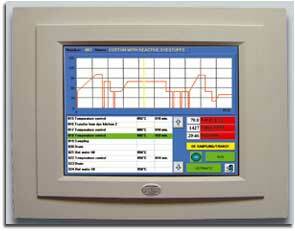 What above said can be done in a simple and direct way by using a software which guides the dyer in programming even very complex cycles and helps him to control all the technological parameters of the machine, by means of several pages of graphical interface which can be recalled by simply touching the display. In addition, a special version of VisualDye, named VisualSteam, has been developed by our technicians for controlling the OBEM apparatuses for thermosetting and moisture regain.